ISPmanager is a popular server and VDS control panel created by the ISPsystem company. VMmanager OVZ is the solution to manage virtualization on the container technology OpenVZ (VDSmanager / VEmanager before). DNSmanager allows to manage domain servers. DNSmanager supports the integration with other ISPsystem products, like ISPmanager and VDSmanager. IPmanager is a supplementary product allows to maintain IP addresses. By ordering IPmanager license you can effectively use your IP addresses. DCImanager (exc. IFXmanager) is the product for data centres and dedicated server sellers. DCImanager allows to automate the maintenance process of dedicated servers. Plesk Panel 12/Onyx is a server control panel with the wide functions for administrator as well as for client. All licenses support includes free installation on the server. Parallels Plesk Panel is the best choice for hosting providers, web designers and site owners. Parallels Plesk Panel 11 is a version of the program that offers a number of new benefits and features for each type of user. Parallels Virtuozzo Containers - operating system-level virtualization solution, a product of Parallels, Inc. This implementation allows running multiple isolated copies of the operating system on a single physical server. All the licenses for DirectAdmin control panel are proposed with technical support. The cheapest version includes the support only with installation on the server. Cpanel is most popular control panel in the world. 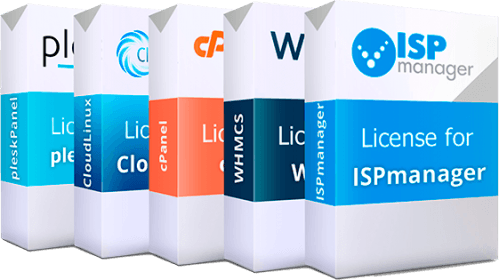 We offer instant license activation and qualified support buying Cpanel in our website. CloudLinux introduces the concept of LVE – LightWeight Virtual Environment for user isolation. Each LVE has the severe restrictions on CPU, memory, maximum quantity of processors and disk input-output which can not be exceeded.